We’d love your help. Let us know what’s wrong with this preview of What the Tweet!? 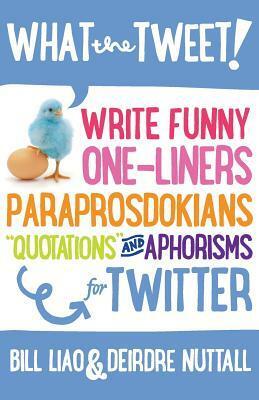 Write Funny One-Liners, Paraprosdokians, Quotations and Aphorisms for Twitter by Bill Liao. To ask other readers questions about What the Tweet!? Write Funny One-Liners, Paraprosdokians, Quotations and Aphorisms for Twitter, please sign up. I won this book as part of a goodreads giveaway, unfortunately I have not gotten it yet. Before starting to read this book, I have to acknowledge it's visual appeal: I love all the different colors of text on the front and back covers. It gives the book a playful feel before you begin to read. I quickly realized that I would want to have a highlighter on hand to draw attention to specific quotes and passages that I'd like to remember in the future. Like the paraprosdokians of the subject matter, this book defied my expectations for it -- in a good way. I had originally thought it to b Before starting to read this book, I have to acknowledge it's visual appeal: I love all the different colors of text on the front and back covers. It gives the book a playful feel before you begin to read. Like the paraprosdokians of the subject matter, this book defied my expectations for it -- in a good way. I had originally thought it to be akin to a joke book filled with 140-character-or-less gems. But it's actually more intellectual than that and explains concepts ranging from literary ideas to psychology to history and more. I also must note that they have a *least* favorite saint: St. Augustine, of whom I also have my difficulties. Thanks, guys, for having my back on this. While, in the end, not a humor book, it does contain humor. It is probably best targeted to individuals who would like more insight into modern social marketing. In our soundbite culture, the suggestions contained here are increasingly important if we want our messages to be heard within the digital din. I finally received this book after weeks of waiting (and marking it us unreceived), so I can finally review it. What the tweet is very good, but the title is misleading. As another reviewer has noted, the book spends and inordinate amount of time discussing the psychology of humor and it doesn't discuss Twitter, and social media, until the final chapter. However, that's what will make this book timeless. Humor is timeless, jokes are timeless, and some of the best zingers are timeless. The examples I finally received this book after weeks of waiting (and marking it us unreceived), so I can finally review it. However, that's what will make this book timeless. Humor is timeless, jokes are timeless, and some of the best zingers are timeless. The examples used are all within the public domain, but what this book does best is break down the sentence structure and show how these jokes work on a fundamental level. The old adage 'If you have to explain the joke, it wasn't funny' doesn't apply here. In this case, explaining the joke, how the first half of the sentence sets it up and how the second half delivers the unexpected punch, helps aspiring comedians and Twitter aficionados improve their technique. I can personally attest to using this book to create a few Paraprosdokians of my own for a story I'm writing. Fun and informative... this is a great combination and describes "What the Tweet!?" In the title is a word that I am sure most people have not heard of: paraprosdokians. I believe the authors define this well in their own words: PARAPROSDOKIAN – A paraprosdokian ( /pærəprɒsˈdoʊkiən/) is wordplay where the latter part of a sentence or phrase is surprising or unexpected in a way that causes the reader or listener to reframe or reinterpret an earlier part. A really good example where the word “righ Fun and informative... this is a great combination and describes "What the Tweet!?" In the title is a word that I am sure most people have not heard of: paraprosdokians. I believe the authors define this well in their own words: PARAPROSDOKIAN – A paraprosdokian ( /pærəprɒsˈdoʊkiən/) is wordplay where the latter part of a sentence or phrase is surprising or unexpected in a way that causes the reader or listener to reframe or reinterpret an earlier part. A really good example where the word “right” changes meaning as the sentence is completed; "War doesn't determine who is right only who is left." This book is full of those. I love learning meanings behind things, and this book does this with the English language. History is provided, meaning is provided and examples on how to make your own statement online is provided. I was very pleased when I received this book from goodreads.com, because at last I could find out what a paraprosdokian is! - and if you want to know, you'll have to get your own copy. This book is full of witticisms with several chuckles to every page. It is best read a small section every day, rather than straight through from cover to cover. It also makes one think about humour and how and why it works. I found myself lying in bed early morning, composing one-liners, and then annoying my husband with them when he awoke. I say annoying, but he actually laughed quite a lot, so the book must have done its job! Oh dear. I really wanted to like this book, but they lost me on the first chapter. This consists of an overlong discussion of paraprosdokians, a term the authors seem intent on cramming down our throats in an effort to make it stick. We then move on to quasi-scientific discussions on the nature of humour, peppered liberally with quotes from the great and the good. Not quotes from Twitter, though; depite the title of the book Disclaimer: I received this book for free through Goodreads First Reads. Oh dear. I really wanted to like this book, but they lost me on the first chapter. This consists of an overlong discussion of paraprosdokians, a term the authors seem intent on cramming down our throats in an effort to make it stick. We then move on to quasi-scientific discussions on the nature of humour, peppered liberally with quotes from the great and the good. Not quotes from Twitter, though; depite the title of the book (itself overlong), Twitter doesn't appear until the closing chapter, but it is a case of too little, too late. I love words and the quirks of the English language. So this book was fun for me to browse. It isn't a "reading" book. But it's packed full of information about how to speak to people and making every wor Anyone familiar with the internet knows that a tweet can get lost in amidst the chatter. What is someone to do if they want their voice to be heard? Check out this book to find ways to make yourself heard amongst all of the noise, how to make your words stand out and make people laugh or think. Disclaimer: I received a free copy of this book as part of the Goodreads First Reads program. An examination of how humour functions, with a particular focus on a type of joke called the paraprosdokian. A paraprosdokian involves an unexpected turn of events or phrase, such that part of the humour is the surprise of the change of direction. This type of humour is well suited to Twitter in that it is relatively short. However, only the final chapter really examines social media. More recommended fo Disclaimer: I received a free copy of this book as part of the Goodreads First Reads program. Academically presented with clear references and interesting background on the word 'paraprosdokians', this doesn't disguide the fact that this is little more than a book of humurous quotations. Nothing wrong with that but it is priced at £10 for 170 odd pages, including index. I would much prefer that this book was extended to allow the knowledgeable authors the chance to expand on the meaning and history of wordplay and create a valid academic text, but it does seem that this b A Goodreads win. I got a copy through Goodreads First Reads. The title of this book doesn't properly describe it's content in my opinion. I was expecting something more boring that tried to force everything into the context of twitter and other social media. I was pleased when my initial impression was wrong. It's a fun book whose main content is organized witticisms that was more stimulating than a collection of quotes would be expected to be. A humorous book with different zingers that have been used in the twitter world, this book also provides insight behind and usage of different lines posted on people's twitter accounts. Funny and entertaining, more of a consistent read-through versus my expectation of simple random one-liners. This book discusses humor with lots of examples of short quotes, the sort that would fit in 140-character tweets. It was fun to read. I would give it 3 1/2 stars. a really clever and fun book to read. Enjoyed it a lot. Won this book as a First Reads giveaway. Funny, interesting book on the nature of humour and how it can be used as a vehicle for serious purposes. I thought it would be a tutorial on writing funny and inspiring tweets. instead, it's a compilation of funny and inspiring tweets already in the Twitter sphere. I won this book as part of a goodreads-first-reads giveaway! Review to come as soon as I receive and read it! Got this as a Goodreads giveaway. It had some interesting things to say. I'm a fan of one-liners. Bill Liao (born William Fu Wei Liao, 1967) is an Australian entrepreneur. He is a venture partner with SOSventures and listed as an influential investor on Twitter. He is married with three children and lives in Cork, Ireland. Liao is a social networking pioneer, author, speaker, and is engaged in not for profit work. Among his non-profit endeavors he is a CoderDojo mentor and he has Bill Liao (born William Fu Wei Liao, 1967) is an Australian entrepreneur. He is a venture partner with SOSventures and listed as an influential investor on Twitter. He is married with three children and lives in Cork, Ireland. Liao is a social networking pioneer, author, speaker, and is engaged in not for profit work. Among his non-profit endeavors he is a CoderDojo mentor and he has participated as an investor and volunteer in The Hunger Project in Uganda, New York and Mexico. He has also been appointed as a special diplomatic envoy for St Kitts and Nevis for sustainable development and the environment. Liao has contributed to the St Kitts and Nevis recovery fund for the sugar cane industry there. He is also a regular attendee at the TED conferences and also the World Economic Forum New Champions conference. Liao was also the Director of Operations (DOO) of telecommunications company Davnet, which achieved the fastest capital value growth in the history of the Australian Stock exchange and which aggregated Internet access in the riser space of office buildings. Davnet was acquired by Japanese telecommunications carrier Nippon Telegraph and Telephone Corporation (NTT) in 1996. Liao left Davnet after the acquisition, turning his attention to other IT endeavors. He was the first external investor in XING.com, then called openBC.com, which was founded by Lars Hinrichs in Germany in 2003. Later, Liao became a supervisory board member. In 2009, he founded WeForest.org, an organisation promoting reforestation as a way to combat global warming. WeForest.org continues, with a stated goal of planting two trillion trees by 2020 and is run from Belgium by its current CEO Marie-Noelle Keijzer. Liao is still involved with WeForest and spoke at TED Long Beach 2011 about it. He was an official part of the delegation of St Kitts and Nevis to the COP15 UN climate change summit in Copenhagen where he also promoted the science and concepts behind WeForest.org. In 2011, Liao joined SOSventures as their European Venture Partner specialising in Internet and social media. He has invested in Mark Little's Storyful venture, and Silicon Republic.